We will be hearing in coming months from a number of the volunteers and researchers currently working with mentor Prof Lester Burgess in Laos PDR. The following blog is by Harriet Brickhill and Jillian Lyall. 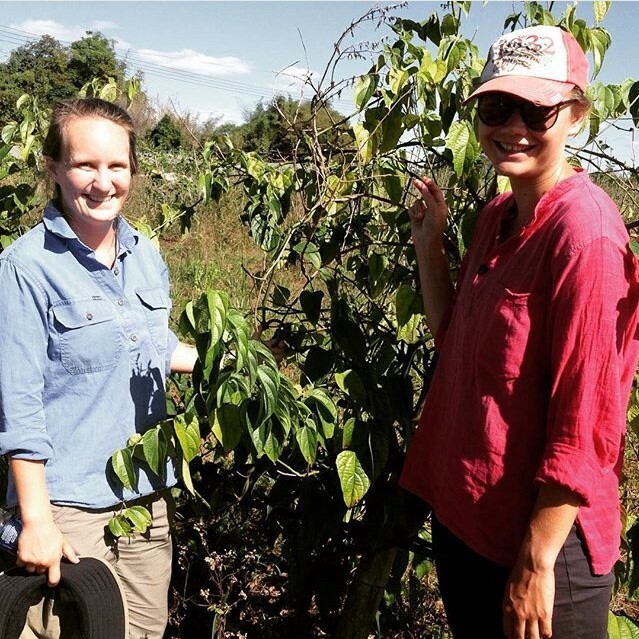 We are two fourth-year Charles Sturt University students studying agricultural science, who have an interest in international research in agriculture. We have come to Laos to help our supervisor, Dr Camilla Vote, conduct a trial on peanuts in Pakse. The trial looks at how water and nutrients can be managed to enable double cropping in the rice growing region in the lowlands of Laos. The work is related to an Australian Centre for International Agricultural Research (ACIAR) project that aims to improve the profitability of lowland farming systems in Laos. The visit was funded by the Government’s New Colombo Plan. While over here, we were fortunate enough to be introduced to Lester Burgess who has been working on plant pathology and biosecurity in Laos and other countries, supported by the Crawford Fund. He kindly invited us to join him on some of his field trips. On Tuesday 26 January, we set off in a tightly-packed minivan, with a team of entomologists, plant pathologists and volunteers, headed by Lester Burgess. Then there was us: two uni students on our very first field trip in Laos, ready to witness specialists in agriculture at work. Our field trip was around the Bolaven Plateau, a region in Champasak, Southern Laos. It is a region that has some of the most fertile soils in Laos, with a high rainfall climate, supporting a diverse range of cropping and livestock enterprises. Our first stop was Madame Kaisone’s farm. Lester regards this farm as one of the Crawford Fund success stories. 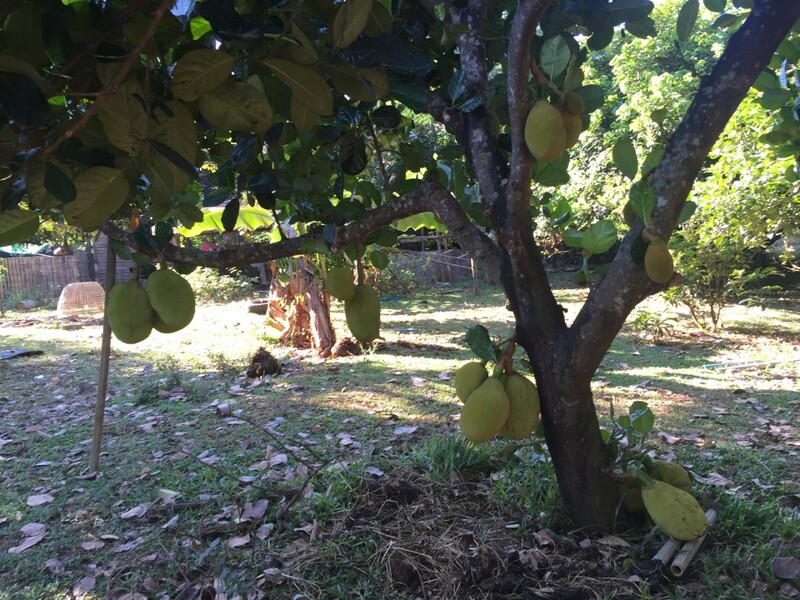 Originally a durian farm which was plagued by Phytopthora cinnamomi (a soil borne fungus), it has been transformed into a thriving enterprise and gave off a positive vibe as we walked beneath the lush canopy of the orchard. Madame Kaisone has taken on board all of Lester’s suggestions, beyond expectation, to create a combination of enterprises that complement each other and reduce the effect of Phytopthora. She now has chickens and cows to utilise their manure, as the ammonium in their manure is scattered around the trees to provide protection from any soil or water runoff from nearby farms. 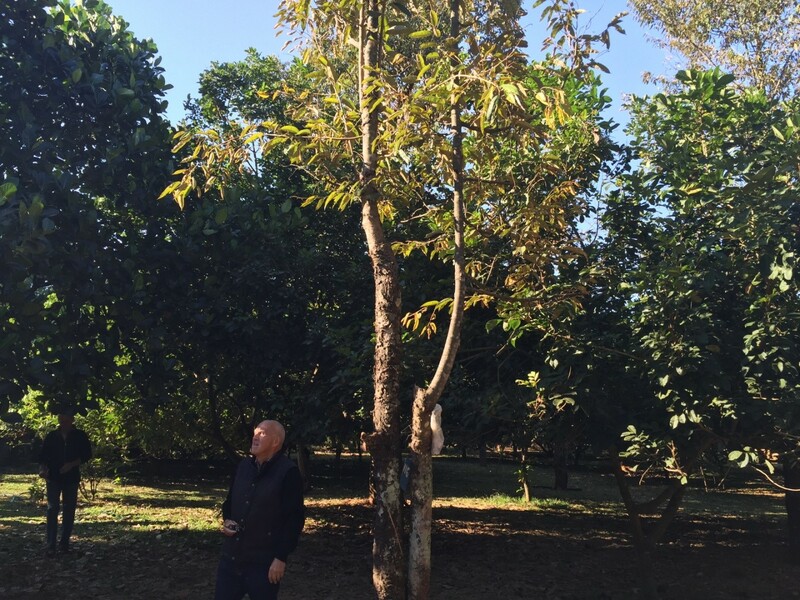 She also started to grow a mix of tree species in her orchard that provide biological barriers to reduce the risk of pest and disease infestation. After Madame Kaison’s, we continued on to visit several other farms, which demonstrated to us the importance of working with local farmers on biosecurity. We could see the devastation Phytopthora was causing throughout the countryside—we passed forests and fields, right across the plateau, which were showing symptoms. This trip really impressed upon us the crucial role that specialists from Australia play in assisting local farmers, and developing new ideas to combat both biosecurity and other agricultural issues that plague the region. For a previous article on volunteers and researchers currently working with mentor Prof. Lester Burgess in Laos PDR, click on the link below.